This book is part of the Artist's Library series from publisher Walter Foster. The book in this series are just 64-pages each so they serve more as introduction to specific topics. The books are targeted at beginners. Assuming no previous knowledge at using acrylic, the book introduces the tools and materials you can use. As a total acrylic noob myself, I did learn a bit more. It then goes into colour theory and presents colour mixes for primary and secondary colours. Color Mixing in Acrylic talks about selected colours, tips on mixing and has example paintings that focuses on certain colours. It's a very elementary book and for the price I guess it's not too bad. I'll give it 3.5 out of 5 stars. 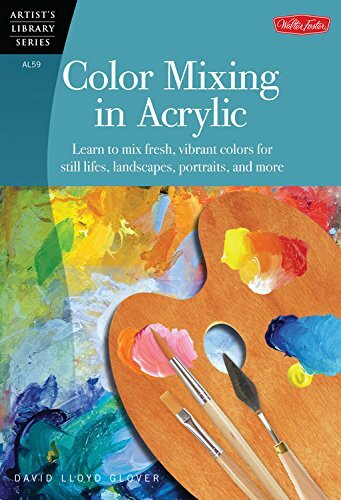 For more comprehensive books on the subject of acrylic colour mixing, I would suggest checking out Color Mixing Recipes for Oil & Acrylic by William F Powell and Color Mixing Bible by Ian Sidaway.